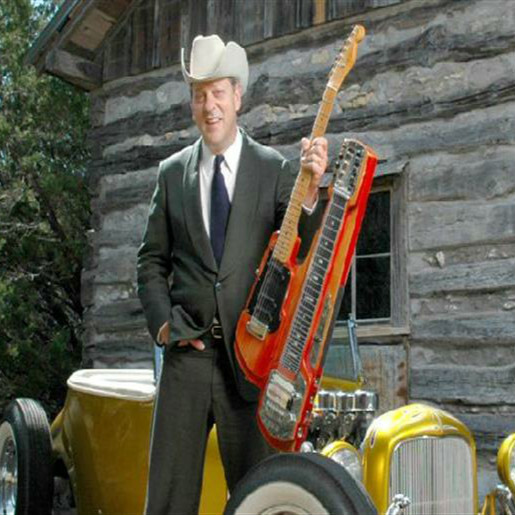 Junior Brown: After settling in Austin, Texas, with his wife and rhythm guitarist-singer, Tanya Rae, he began his weekly tenure at the legendary Continental Club where the band successfully honed their craft leading ultimately to a major label signing (Curb), a Country Music Association Award (CMA), three Grammy nods, a Bluegrass Music Association Award (IBMA) with legend, Ralph Stanley, duets on record and video appearances with everyone from Hank Thompson and George Jones to The Beach Boys and Stone Temple Pilots. Then came movies (Me Myself and Irene, Trespass, Still Breathing, The Dukes of Hazard, Blue Collar Comedy Tourl and II), TV shows (X Files, Chris Issac, Austin City Limits), multiple appearances on Letterman, Conan, Saturday Night Live, and even a cameo appearance in SpongeBob Squarepants. Lately Junior has been concentrating just as hard as always on his songwriting skills with his more recent material, which still references dry wit, serious sentiment and instrumental prowess. Some of these new songs show a previously uncharted direction into modern technical jargon. Just one listen to selections like “Hang Up and Drive” or “Apathy Waltz” and you will have no doubt that there is more here than just simple Retro-Billy. How does someone describe the indescribable to one who hasn’t seen or heard? What comes to mind for me is the title to one of Junior’s early albums which refers cleverly to his creation, the “Guit—Steel”, the instrument consolidating standard and steel guitars allowing him to switch mid-song between the two while singing. The title of the album simply states the best advice that can be offered: GUIT WITH IT!